Either way, we had fun listing them… enjoy! Did you hear the joke about Sodium hypobromite? I don’t trust Atoms. They make up everything! What do you do if your chemistry teacher is sick? If you can’t Helium or Curium, you Barium. I was going to tell you a chemistry joke, but all the good ones Argon. I was reading a book on Helium. 2 men walk into a bar. #1 says: I’ll have a glass of H2O pls. After drinking it all, he was refreshed. #2 says: I’ll have a glass of H2O too. He drank his glass & died. Hmmmm. Do you know why? Helium walks into a bar and asks for a drink. The bartender says, “Sorry, we don’t serve noble gases here. Molecule 1: I just lost an electron. Molecule 2: Are you sure? What do you call a joke that is based on cobalt, radon, and yttrium? So they don’t get spotted. Why did the germ cross the microscope? Why does the spinal cord belong in the brass section of an orchestra? Because it has dorsal and ventral horns. Did you hear about the famous microbiologist who visited 30 different countries and spoke 6 languages? What’s the difference between a dog and a marine biologist? One wags a tail and the other tags a whale. What did the dog say to his owner? What did the stamen say to the pistil? What did the microbiology student get for being late to class? How much room do fungi need to grow? Two blood cells met and fell in love. Alas it was all in vein. What is a physicist’s favourite food? It was about time too. Why is quantum mechanics is the original “original hipster”? It described the universe before it was cool. What did one quantum physicist say when he wanted to fight another quantum physicist? Have you heard that entropy isn’t what it used to be? Why is electricity an ideal citizen? Because it conducts itself so well. Which books are the hardest to force yourself to read through? What happens when electrons lose their energy? When do we want it? Irrelevant! If you’re thinking about telescopes as a hobby, you should look into it. How do astronomers organize a party? It is reported that Copernicus’ parents said the following to him at the age of twelve: “Copernicus, young man, when are you going to come to terms with the fact that the world does not revolve around you. When it’s down to its last quarter. What did the volcano say to his wife? On tectonic plate bumped into another. Wanna hear the mountain joke? Why do Geologists go to concerts? To get their “Rock” On. Where do geologists like to relax? My rocks are gneiss, don’t take them for granite. Why can’t you argue with Pi? There are 10 kinds of people: Those who understand binary and those who don’t. What do you call a number that can’t sit still? What did one maths book say to the other? Love science? 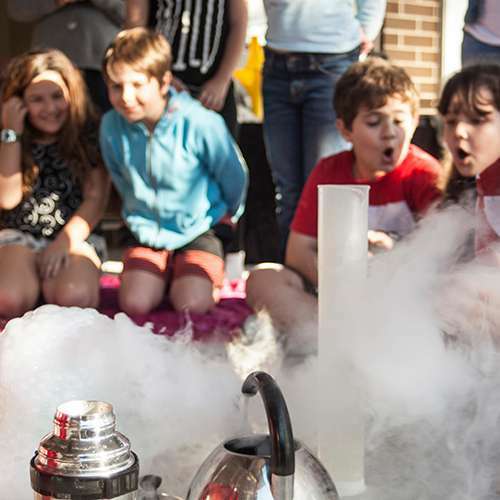 Have a blast with a science party! Know more jokes? Tell us them! Write your best (PG) science jokes below. The punnier the better!